The Pound took the stage yesterday in a very volatile session. 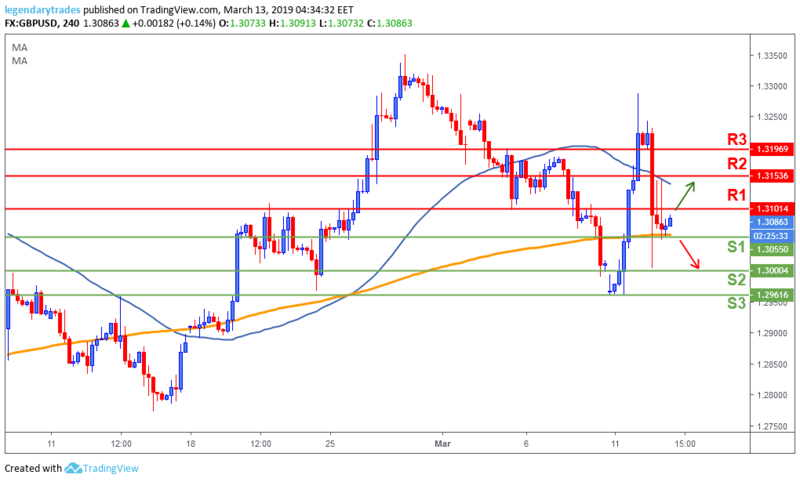 Earlier in the session, the GBP/USD pair soared to 1.3289 after UK PM May said that she secured legally binding changes to the Brexit deal with EU's Juncker. Later on however, the pair collapsed to 1.30, as the UK's Attorney General Cox said that the legal risk remained unchanged and that the UK will have no lawful means of leaving the Irish Backstop arrangement. By the end of the day, the UK Parliament rejected May's deal by 391-242 votes potentially changing the market sentiment to the bull’s side in the short-term. Today, the UK will release the Spring Statement but the main focus remains on any further Brexit developments. The Pound fell more than 200 pips yesterday but found support around 1.3055 (S1) just above the 200-day moving average. The bulls need to protect this level and break above 1.31 (R1) to keep a strong short-term momentum going. A break below 1.3055 (S1), will give the control back to the bears and price will likely test the 1.30 (S2) level again.